These few photos give a flavour of the event. They begin with the Farm Centre at the start of the Barleylands Tour, followed by pictures of the Education Room at lunch time. 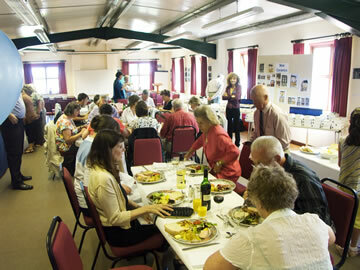 We had met here at 11am for coffee when Hazle gave a talk about the day, the displays of Hazle history and the ceramics. As well as some older and current pieces, there were two new models plus many Signing Specials. Click to view Ceramics. 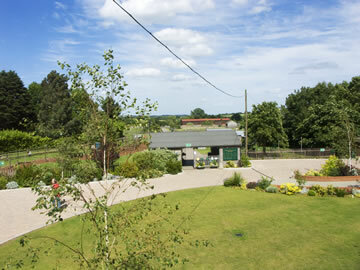 Barleylands Farm Centre entrance. The miniature railway left of the railings runs every half hour. 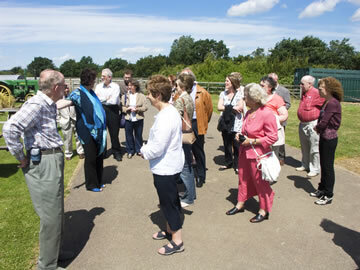 Hazle talks to some of the group about the Farm Centre. 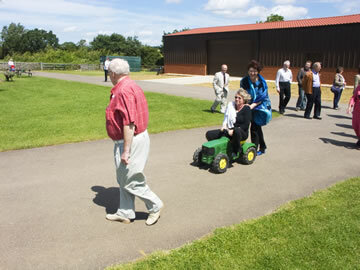 There is a restored tractor to Hazle's left. 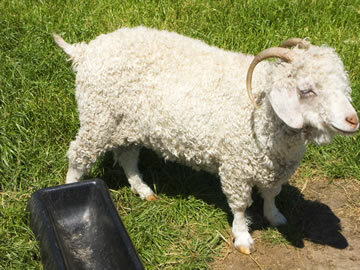 One adorable Angora goat basking in the sunshine. Taken for a ride - Hazle on Joy Pannaman's tractor! 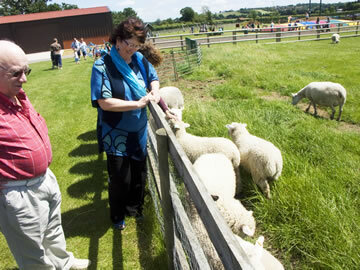 Hazle and Brian Pannaman enjoy the lambs. Elsewhere "Hug a Bun" is popular with children! 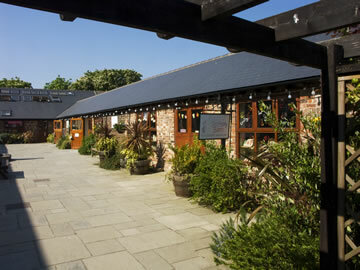 Hazle's Barn in one Craft Village courtyard. We visited a jeweller, wood turner and other crafts. 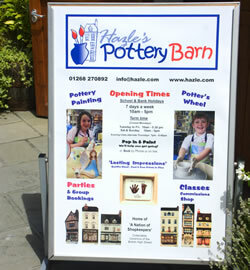 The numerous activities of Hazle's Pottery Barn. 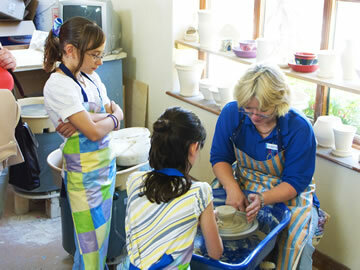 Two US sisters with Marion on the Potters Wheel. We began in the Education Room with coffee and a short talk from Hazle. At the far end is theatre-style seating. More tables were added for lunch here. Displays and ceramics are around the sides. 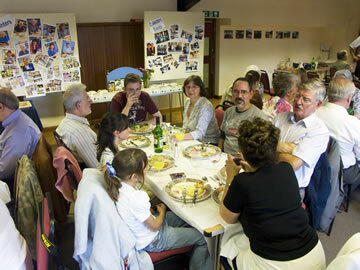 Displays of Hazle history are behind the diners. We all received an information pack to take home, plus a choice of letter rack or note holder decorated with Hazle Ceramics images as event gifts. Looking down the room, with waitress Judy! After lunch Anne Padfield talked on old shops with slides. 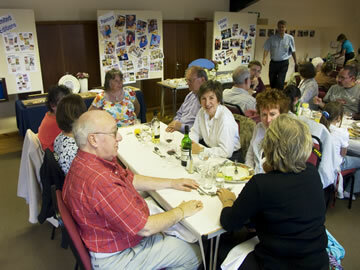 With everyone still seated there was a presentation to Judy, retiring to Suffolk with husband Paul. 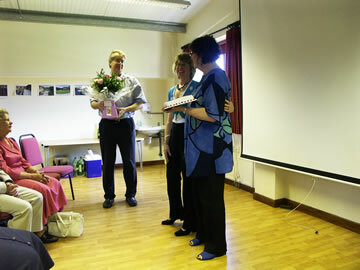 A tearful Hazle spoke of Judy's 12 years service. 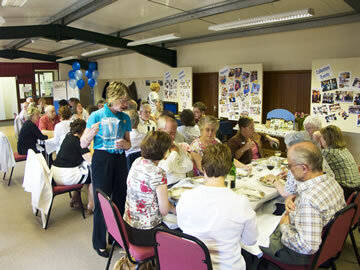 A painter from 1996, Club secretary from 2001 and great with people at the Barn from 2005. There were flowers and a cake iced with Judy's interests. After a tearful Judy spoke too, staff (mostly painters) joined her and Hazle. 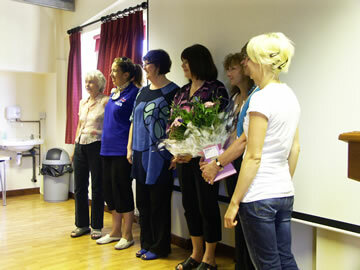 From left: Doreen, Nicci (who takes Judy's job), Hazle, Michelle, Iona, Judy and Cara. Tea and cakes followed.